Chapter 1 - Lab-on-a-chip, microfluidics and interfacial electrokinetics. Chapter 2 - Basics of electrical double layer. Introduction to electrical double layer (EDL). Basic electrokinetic phenomena in microfluidics. Chapter 3 - Pressure-driven flows in microchannels. Pressure-driven electrokinetic flows in slit microchannels. Pressure-driven electrokinetic flows in rectangular microchannels. New understanding of electro-viscous effects. Chapter 4 - Electroosmotic flows in microchannels. Electroosmotic flow in a slit microchannel. Electroosmotic flow in a cylindrical microchannel. Electroosmotic flow in rectangular microchannels. Transient electroosmotic flow in cylindrical microchannels. AC electroosmotic flows in a rectangular microchannel. Electroosmotic flow with one solution displacing another solution. Analysis of the displacing process between two electrolyte solutions. Joule heating and thermal end effects on electroosmotic flow. Chapter 5 - Effects of surface heterogeneity on electrokinetic flow. Pressure-driven flow in microchannels with stream-wise heterogeneous strips. Pressure-driven flow in microchannels with heterogeneous patches. Electroosmotic flow in microchannels with continuous variation of zeta potential. Electroosmotic flow in microchannels with heterogeneous patches. Solution mixing in T-shaped microchannels with heterogeneous patches. Heterogeneous surface charge enhanced micro-mixer. Analysis of electrokinetic flow in microchannel networks. Chapter 6 - Effects of surface roughness on electrokinetic flow. Electroosmotic transport in a slit microchannel with 3D rough elements. Effects of 3D heterogeneous rough elements. Chapter 7 - Experimental studies of electroosmotic flow. Measurement of the average electroosmotic velocity by a current method. Measurement of the average electroosmotic velocity by a slope method. Microfluidic visualization by a laser-induced dye method. Velocity profiles of electroosmotic flow in microchannels. Comparison of the current method and the visualization technique. Flow visualization by a micro-bubble lensing induced photobleaching method. Joule heating and heat transfer in chips with T-shaped microchannels. Joule heating effects on electroosmotic flow. Chapter 8 - Electrokinetic sample dispensing in crossing microchannels. Analysis of electrokinetic sample dispensing in crossing microchannels. Experimental studies of on-chip microfluidic dispensing. Effects of spatial gradients of electrical conductivity. Controlled on-chip sample injection, pumping and stacking with liquid conductivity differences. Chapter 9 - Electrophoretic motion of particles in microchannels. Single spherical particle with gravity effects. Single cylindrical 546particle without gravity effects. Spherical particle in a T-shaped microchannel. Two particles in a rectangular microchannel. Chapter 10 - Microfluidic methods for measuring zeta potential. Streaming potential method. A lab-on-a-chip device is a microscale laboratory on a credit-card sized glass or plastic chip with a network of microchannels, electrodes, sensors and electronic circuits. These labs on a chip can duplicate the specialized functions as performed by their room-sized counterparts, such as clinical diagnoses, PCR and electrophoretic separation. The advantages of these labs on a chip include significant reduction in the amounts of samples and reagents, very short reaction and analysis time, high throughput and portability. Generally, a lab-on-a-chip device must perform a number of microfluidic functions: pumping, mixing, thermal cycling/incubating, dispensing, and separating. Precise manipulation of these microfluidic processes is key to the operation and performance of labs on a chip. The objective of this book is to provide a fundamental understanding of the interfacial electrokinetic phenomena in several key microfluidic processes, and to show how these phenomena can be utilised to control the microfluidic processes. 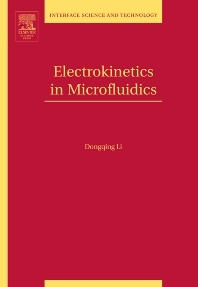 For this purpose, this book emphasises the theoretical modelling and the numerical simulation of these electrokinetic phenomena in microfluidics. However, experimental studies of the electrokinetic microfluidic processes are also highlighted in sufficient detail.